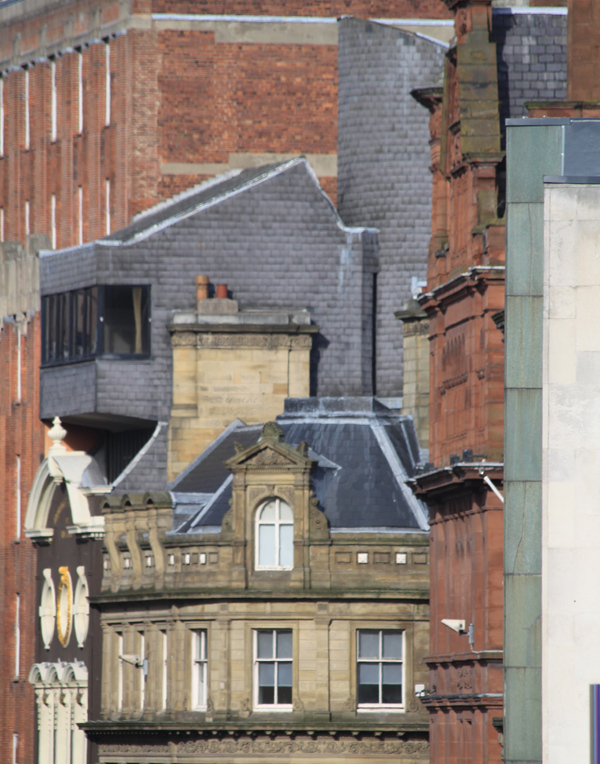 When I took this picture of buildings all jostling for space with each other on a Liverpool street I was going to just post it as a throw away picture post. However this was one of the views, with its variety of buildings from different eras, that inspired my render Accretion City. So I thought I might expand a little on the idea that pictures (especially 3D renders) need to be careful of avoiding mono culture scenery. I really like CityEngine (I think my reviews of CityEngine Indie and CityEngine Vue made that pretty obvious). A lot of 3D scenes reveal their artificial nature because they use the same elements over and over again. I can’t remember which film it was but I do remember one of the 3D cartoons with insects films a few years ago where all the background insects looked the same. Every time I saw a group of ants in the background I knew I was watching a CG movie and it pulled me out of the story. Vue users have become so used to EcoSystems they almost forget the power the variety gives in making scenes more believable through variation. The sample scenes are great but they tend to create models of settlements that are very mono culture in nature. Even when they feature different types of area they tend to be of one era. CityEngines way of creating models of a city is great but they aren’t settlements that grow over time – and trying to making them do that is a task that would scare me and probably wouldn’t have huge benefits. So the trick will be to include a variety of building types to make it seem a model has grown over time. That will include creating models that fuse multiple styles so the old can be extended sometimes in a way that would have Prince Charles talking about carbuncles if these were real buildings. Anyway somewhere along the lines before I’d finished writing what should have been a complete post I was struck by how I don’t just think this way for 3D stuff but also when I’m world building for stories or games. In fact I went as far as writing up a formalised way of doing that when I put together STEEPVM. Thats quite a formal method and I know that most of the time the ideas for a setting layer themselves by accretion until, hopefully, I have something believable. Thankfully I don’t have to create some sort of procedural set of instructions for this to work. However I do have to be careful of the trap that lies in wait – a curate’s egg setting. It is far too easy to be lured by lots of shinny, shinny ideas and to throw them all into a setting and be left with a mess. I hate to pick on one particular target but the RPG Waste World seemed to me to suffer baddly from this. On the flip side I was really pleased when Nightfall Games posted on their new(ish) forums that they won’t be updating SLA’s technology because at the moment, for me, its achieved a level of accretion without tipping over into being a mess.